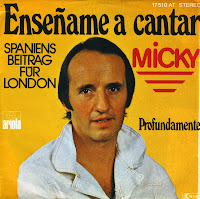 Micky was born as Miguel Ángel Carreño Schmelter in Madrid in 1943. He began his music career in 1962 leading the band Micky y Los Tonys, which released 30 singles and 5 albums. He started a solo career in the Seventies. After his single 'Bye bye fräulein' (1976) entered the charts in Germany, Luxembourg and the Netherlands, he was chosen to represent Spain during the 1977 Eurovision Song Contest. The song 'Enséñame a cantar' ('Teach me to sing') was written by Fernando Arbex. On the night of the Contest, it finished ninth in a field of 18 competitors.